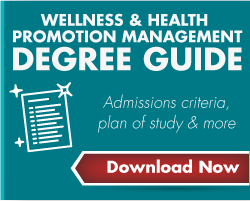 Advance your career with a wellness and health promotion management master's degree online. Reactionary care is a thing of the past. The new healthcare model relies on prevention, with health insurers and employers alike recognizing that the most efficient system is one that keeps people out the hospital in the first place. That's where you come in. With a Master of Science in Wellness and Health Promotion Management, you'll create, manage and assess wellness initiatives in corporate, community and clinical settings. NMC has served as an educational leader in wellness and health promotion for more than 20 years. As a healthcare institution, we understand the importance of producing results-oriented health promotion programs and services. The master's degree can be completed in 19-22 months. Flexible online format allows you to advance your educational goals while balancing your personal and professional responsibilities. Courses are 5-10 weeks long, with scheduled breaks every 5 weeks. The program requires 36 credit hours for completion. Access courses online at any time of the day. Complete a practice-based capstone rather than a thesis. Program curriculum aligns with the National Commission for Health Education Credentialing (NCHEC) Areas of Responsibility that are required for students to take the CHES exam. According to the Bureau of Labor Statistics, the median salary for Health Educators in May 2017 was $53,940 ($25.93 per hour), while projected job growth is expected to be 16% between 2016 and 2026, faster than the average across all occupations. To be successful with your online courses, you should have a basic understanding of computers and the internet. Read more about the minimum knowledge and hardware requisites on our Online Technology Requirements page.